I saw my first live orchid when I was about twenty years old. I knew about their existence, read about them in books and maybe even saw them once or twice on TV (not sure about that part though) but they just weren’t present where I grew up. As I tried to remember from where I knew about orchids, Nero Wolfe mysteries by Rex Stout were the first suspects that came to mind. Those who read the novels know the important part that the orchid greenhouse plays in the stories: the fact that the famous detective was spending in there four hours daily making clients, police and everybody else adjust their schedules around that activity is one of the common elements of most books in the series. I liked these mysteries and read many of them. So it was hard not to get intrigued by the orchids. But no, these books came into my life later and they weren’t my first encounter with the fascinating flowers. I think the first impression – or rather imprint on my psyche – had been left by the film based on Arthur Conan Doyle‘s novel The Hound of the Baskervilles. Do you remember the scene when Miss Stapleton meets Dr. Watson for the first time and, thinking he was Sir Henry Baskerville, tries to warn him? That is the only scene where orchids are mentioned in the book and it’s not too captivating. So why did it have such an effect on me? As I mentioned, it was a film not a book and orchids played a much more prominent role there. Unlike that character in the book, Sir Henry in this film version was depicted as a slightly goofy and peculiar man. I would go so far as defining him as a comic relief. There is a scene in the movie – a totally original one, there’s nothing even remotely close to it in the book: Sir Henry and Dr. Watson, while waiting in Sir Henry’s room to discover the reason for the secret night journeys of the butler, Mr. Barrymore, to the window, got drunk and Sir Henry, for a minute and a half of the screen time, kept asking Dr. Watson what exactly Miss Stapleton, with whom he was falling in love, told Dr. Watson about orchids and Dr. Watson kept answering: “She said: it is too early to see the beauties of the place since orchids haven’t started blooming yet.” And they went on and on about it (see the video clip below; it doesn’t have subtitles but body language and manner of speech is clear enough to understand what is going on). That last part about orchids became a popular expression. I’m not sure if others caught the season swap – I didn’t. It wasn’t until I looked up the original quote for this post that I realized that there was a switch. I don’t know with any degree of certainty why the script writer or the director decided to do that: I doubt it was done for the phrase. But knowing where the movie was filmed, my guess is that they’d decided it would be easier to depict Devon’s nature in early spring without any greenery. And did I mention we had no orchids whatsoever? Black Orchid by Tom Ford does not require an introduction: by now everybody has tried it and made up their minds (but for those who landed on this post right after returning from a desert island, Kafka’s review provides all the information for this perfume you might crave). I just want to touch on a couple of aspects. First, Black Orchid is one of a few perfumes that live up to the qualifier: it smells deep and dark. It’s not a day-wear perfume and it even smells differently in the evening (OK, I know that this part is subjective but I had to share how I feel). Second, I fail to smell chocolate in Black Orchid. Usually I’m not surprised when I cannot get some notes since my nose isn’t too good with discerning them. But chocolate?! Do you know how many kilograms of dark chocolate I’ve consumed?!! 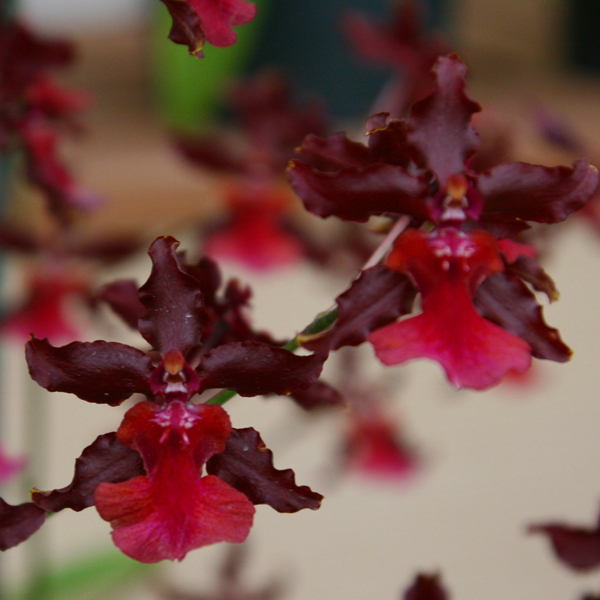 Speaking of chocolate, are you aware that there is an orchid variety that smells like chocolate? I encountered it on my Hawaiian trip – in a greenhouse though, not in nature (see the picture below). Black Orchid doesn’t smell like it either. Back to durability… I’ve recently discovered that my mini bottle of Black Orchid has gone bad. I got it in a swap so I’m not sure how old it is but it reinforces my bias against dab mini bottles. If I go through the remaining spray sample I might consider a small bottle since I like both the scent and the bottle. And I like the idea of a black orchid. This entry was posted in Acquaintance with letters, Favorite Perfumes, Not a Review and tagged Black Orchid, Tom Ford. Bookmark the permalink. I know how it happens! Sometimes an off-hand comment might ruin perfume (and other things :) ). Maybe the dark chocolate in Black Orchid is the cheap variety and you can’t recognise because you only eat the good stuff? :) It’s been ages since I’ve smelt it. 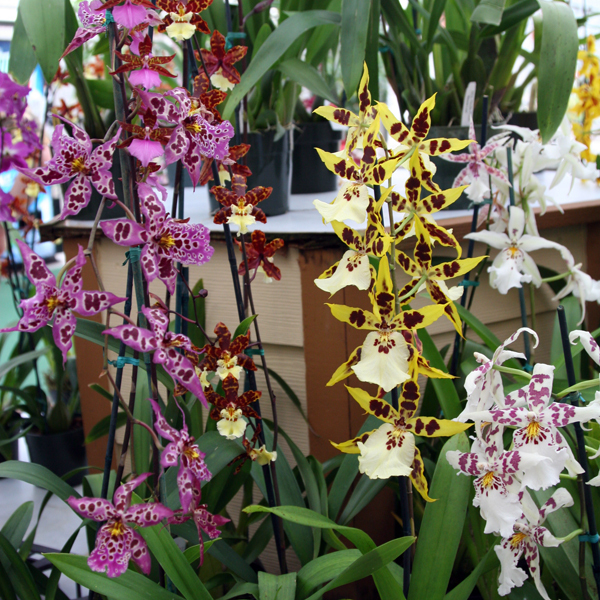 Have you read The Orchid Thief by Susan Orlean? It’s not a novel but you might like it as it’s about orchid obsessives (not that you are one!). It was made into a film starring Meryl Streep. I haven’t read this book but watched the movie and liked it a lot (to the extend of buying a DVD for my collection). I loved the backstory to this post about the Hound of the Baskervilles and was unaware of either variant of that orchid comment. Like you, I have a poor track record at keeping orchids – one only lasted a week before morphing into the giraffe pictured(! 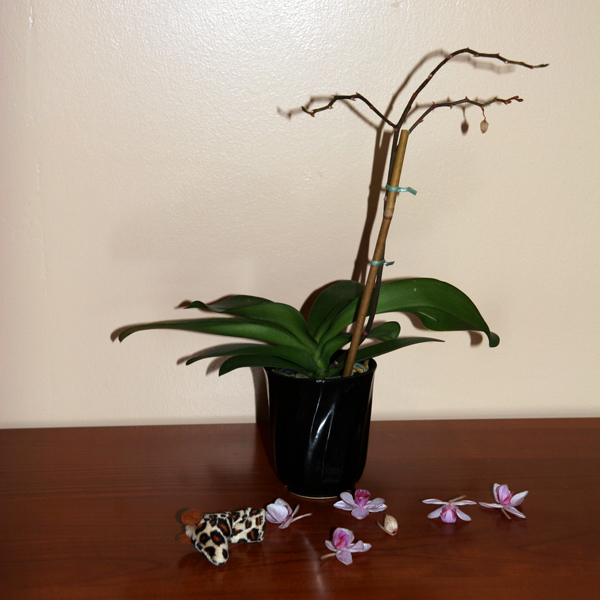 ), but after I had that tabby cat to board in January, its owners bought me an orchid which is still alive in the bathroom – it dropped a petal while I was away last week, but looks in pretty rude health otherwise. Ref the perfume Black Orchid, it is ages since I tried it and I don’t rightly recall the chocolate note either. My favourite flanker is the Voile de Fleur one which smells nothing like the original! The orchid my vSO gave to me for the recent Valentine’s Day is still blooming so I’ll try one more time not to kill it (and then we’ll see if I can make it bloom again). I have somewhere another great play on giraffe theme (no orchids involved) but I couldn’t find it today. I’ll send it to you once I find it. I liked Voile de Fleur but I didn’t spend enough time with the sample because I knew it was discontinued. It’s been awhile since I’ve revisited Black Orchid but I don’t remember getting chocolate from it either. I remember a black licorice smell and that earthy/mushroomy aspect, which actually put me off. (which is probably why I haven’t returned to it for awhile!) But maybe I’ll give it another try the next time I come across it. I do love dark chocolate! Oh my gosh, I thought the giraffe finger puppet was a tiny snake at first! Now that I realize what it is, it’s very cute. Bummer about the orchid though. You should definitely revisit Black Orchid: after smelling many other perfumes since your previous encounter you might perceive it differently. I don’t mean that you’ll fall in love with it but it might be an interesting experiment. As for the finger puppet, it wasn’t a staged photo: a daughter of my friend gifted it to me when they visited and I put it on the dresser next to the blooming orchid. Days later when I saw that composition I just had to take a picture. I love mysteries…I now need to look up the Nero Wolfe mysteries. Like you or probably even worse than you, I don’t do well with plants at all! As to TF Black Orchid, you may have seen me mention that a colleague at work wears it at nuclear levels so I feel like I never have to wear it (I have a little decant). P.S. How is Rusty with Orchids? I’m not sure how those mysteries would read today but I enjoyed reading them back then. Give them a try if you come across one of them. Orchids!! One of my favourite flowers! To be honest, that was one of the reasons I blind bought Black Orchid in the first place. Fortunately, I like it and enjoy wearing it from time to time but I can’t get the chocolate… Mushroomy, stale chocolate, maybe? I would love to see wild orchids! Even when in Hawaii I’m not sure I’ve ever seen them growing outside of greenhouses. Black Orchid isn’t the worst blind buy: it’s so popular that you can always swap it if it doesn’t work for you. Though you couldn’t know that back when you bought it – if you did around the time it had been released. Definitely a multimedia fun read! Thank you. I have smelled this chocolate orchids. My BFF Kath’s father was orchid crazy for years and he had all the freaky ones. Little hint for orchids, get a piece of wet cord and push it into the heart of the pot from underneath with a tail that can trail in the saucer water under the pot, same as you would for African Violets. It seems to offer exactly the right amount of water for them. LOVED Black Orchid for ages but haven’t had a bottle in years. Thank you for the tip. I’ll look at the pot I have to see if I can do that. It’s interesting what people choose to respond to in comments Undina, sometimes I am blown away too. Usually surprised, just like you, that only one comment zeros in on something I am really excited about. I too love the scent of orchids and the chocolate scented orchid is one I have read about but never encountered myself. They do have a lovely range of smells, one I remember in particular was a catellya with a beautiful feminine scent I found in a greenhouse at Sonnenburg in upstate NY. Really a finished perfume all on its own-naturally I don’t remember which kind it was but wish I did. Other than that chocolate one I’ve never experienced any other orchids with a scent. I suspect I would have tried to take an even better care of them had they been fragrant in addition to being beautiful.